What is a sublease agreement in NYC? What does a sublease contract look like? When do you need board approval for a sublet? We’ll answer these questions and more in this comprehensive article on sublease agreements in New York City. 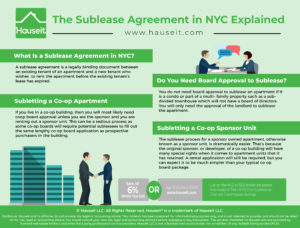 What Is a Sublease Agreement in NYC? Do You Need Board Approval to Sublease? A sublease agreement is a legally binding document between an existing tenant of an apartment and a new tenant who wishes to rent the apartment before the existing tenant’s lease has expired. The new tenant is referred to as the under-tenant or sublessee, while the existing tenant is referred to as the over-tenant or sublessor. The sublease agreement will reference the master lease agreement between the existing tenant and the landlord. Most master lease agreements will require the tenant to obtain landlord approval before subleasing their apartment. Pro Tip: Shareholders of co-op apartments are technically tenants who hold a proprietary lease to their apartment. As a result, anytime a co-op apartment owner wants to rent their apartment, they are technically subletting their apartment since the entire building is owned by the cooperative corporation. You do not need board approval to sublease an apartment if it is a condo or part of a multi-family property such as a sub-divided townhouse which will not have a board of directors. You will only need the approval of the landlord to sublease the apartment. With that said, you’ll still need to follow any building rules and city regulations around minimum lease terms. For example, buildings generally will not allow lease terms shorter than 30 days. In fact New York passed a law in 2016 prohibiting even the advertisement of rental listings for terms shorter than 30 days. If you live in a co-op building, then you will most likely need coop board approval unless you are the sponsor and you are renting out a sponsor unit. This can be a tedious process as some co-op boards will require potential sublessees to fill out the same lengthy co-op board application as prospective purchasers in the building. This can be highly discouraging for someone who simply wants to rent an apartment and is not expecting to have their personal privacy completely invaded. Having a lengthy board package requirement just to sublet an apartment can make a co-op apartment extremely tough to rent out. However, that’s precisely the intention of many co-op buildings which have a strong preference for owner occupancy. Pro Tip: With interest rates still at historic lows, why not buy an apartment in NYC instead of continuing to pay sky high rent to your landlord? 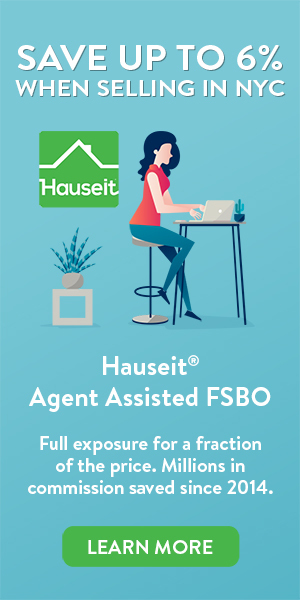 Do a buying vs renting analysis first and then check out our Closing Cost Calculator for Buyers in NYC to see if you can afford to become a homeowner. 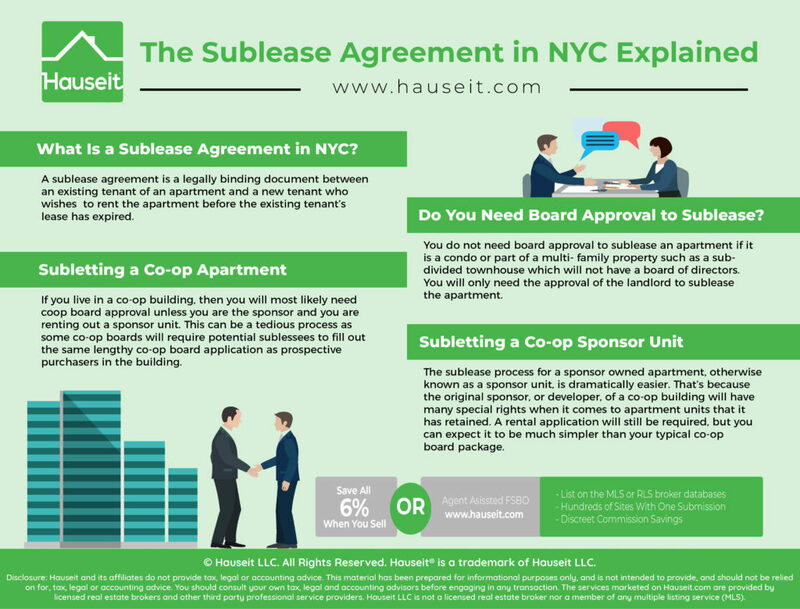 The sublease process for a sponsor owned apartment, otherwise known as a sponsor unit, is dramatically easier. That’s because the original sponsor, or developer, of a co-op building will have many special rights when it comes to apartment units that it has retained. These apartments that the sponsor has retained are called unsold shares of the coop because they have never been sold, and the units are typically in original condition from when the building was first developed by the sponsor. A rental application will still be required, but you can expect it to be much simpler than your typical co-op board package. In fact, a rental application for a sponsor owned co-op apartment will resemble your typical condo application which can often only be a page or two. Pro Tip: If you’re not interested in ever completing a lengthy and invasive co-op board package, consider buying a new construction home or a re-sale condo in NYC. Better yet, pair your purchase with our First Time Buyers Program where you can earn a credit of up to $20,000 or more against your closing costs in NYC. Mark Jones AS UNDERTENANT(S), (hereinafter “Tenant” or “Resident”) AND DANIEL YOUNG, AS OVERTENANT (hereinafter “Landlord”). The provisions of this rider to the lease agreement expiring 7/30/2019 are intended by the above parties to carry the same force and effect as if fully contained in the signed lease agreement, creating binding contractual obligations on the signatories. In the event of any conflict between the printed lease form and this rider, the terms of this rider will prevail. 1) Tenant covenants and agrees to pay and be responsible for all costs, disbursements, and attorneys’ fees incurred in any action to collect any debt pursuant to this agreement or to evict the tenant resulting from any breach of this lease. 2) Tenant shall immediately notify superintendent and management of any emergency that may arise day or night. 3) All service requests and notifications must be made in writing, and shall include the Date, Tenant Name, Apt. #, and a brief description of the issue. 4) Rent checks shall be payable to DANIEL YOUNG, or as directed by Landlord. Please write apartment number and state purpose for payment on check. Rent must be received on or before the first of the month. Rent checks may be sent to 111 Fifth Avenue, New York, NY 10034 as directed by Landlord. 5) Tenants must maintain apartment insurance to protect the value of all property both in the apartment and garage. DANIEL YOUNG or any of its employees are not responsible for any damaged, destroyed, or stolen property. 6) In the event of any conflict between the printed lease form and this rider, the terms of this rider will prevail. 7) Undertenant will not sublet or assign his/her rights to the apartment without written consent of the Overtenant. 8) Rent is due and payable on the first day of each month. Superseding anything in the printed form of this lease to the contrary, Overtenant is not required to send any notice to Undertenant regarding payment of rent and Overtenant may commence eviction proceedings without any demand for rent required under this lease. 9) There are no waterbeds or pets of any kind allowed in the demised premises. The Fifth Avenue Manhattan Cooperative is a non smoking building. Smoking is not allowed pursuant to the Coop House Rules. 10) Undertenant will not paint any exposed brick walls or wood trim, doors or windows that are presently stained. Undertenant will not make holes in the brick, only in the mortar between the bricks, and only to hang shelves or pictures. 11) Undertenant agrees not to wallpaper, tile or use any covering or to paint floors, walls or ceilings of the demised premises without the express written permission of the Overtenant in each instance. Failure of Undertenant to procure consent prior to performing any of the foregoing will incur the obligation upon the Undertenant to remove or scrape all traces of the same. 12) The security may not be used as rent for the last month of the lease. 13) Undertenant will provide Overtenant with a full set of keys to the demised premises for the purpose of inspection and or emergency repair. Failure of Undertenant to provide keys as herein provided will incur obligation upon Undertenant for any damages resulting from Overtenant’s inability to gain access including cost of forced entry. 14) In the event that rent is not received by the close of business on the tenth (10th) day of each month, Undertenant will pay a Late Charge as additional rent equal to ten percent (10%) of the rent. 15) There will be a thirty dollar ($30.00) fee imposed as additional rent for any check returned unpaid to the Overtenant. 16) All costs and expenses that Undertenant assumes or agrees to pay pursuant to this Lease shall, at Overtenant’s election, be treated as Additional Rent and in the event of nonpayment thereof, Overtenant shall have all rights, and remedies herein provided for in the case of nonpayment of rent. If Undertenant shall default in making any payments required to be made by Undertenant or in observing or performing any of the terms or provisions on Undertenant’s part to be observed or performed, Overtenant may at any time after first giving to Undertenant ten (10) days written notice thereof, or without notice in the event of any emergency, perform the same for the account of Undertenant and if Overtenant makes any expenditures or incurs any obligations for the payment of money in connection therewith, such sums paid or obligations incurred with interest thereon shall be deemed to be Additional Rent hereunder and shall be paid by Undertenant to Overtenant within ten (10) days of rendition of any bill or statement to Undertenant therefore. 17) Undertenant leases the demised premises in “as is” condition. 18) Personal to Undertenant. The rent set forth in this Lease/Renewal Lease is personal to the Undertenant named in the Lease only and does not inure to the benefit of the Undertenant’s successors or assigns. 19) Overtenant sublets the premises to you, the Undertenant, for the Term. You the Undertenant, agree to pay the Rent and other charges as required in the Sublease. You, the Undertenant, agree to do everything required of you in the Sublease, and shall not violate any provision of the Proprietary Lease, House Rules or By-Laws. 20) The Sublease is subject to the Over-Lease. It is also subject to any agreement to which the Over-Lease is subject. You the Undertenant, state that you have read the Over-Lease and will not violate it in any way. 21) The Over-Lease describes the Landlord’s duties. The Overtenant is not obligated to perform the Landlord’s duties. If the Landlord fails to perform, you, the Undertenant, must send the Overtenant a notice. Upon receipt of the notice, the Overtenant shall then promptly notify the Landlord and demand that the Over-Lease agreements be carried out. The Overtenant shall continue the demands until the Landlord performs. 23) You, the Undertenant, have no authority to contact or make any agreement with the Landlord about the premises or the Over-Lease. You, the Undertenant, may not pay rent or other charges to the Landlord, but only to the Overtenant. 24) Falsification of any of the information submitted in the application, or omission of material information herefrom, may result, without limitation, in the revocation of this sublease. 25) The Undertenant recognizes that the premise to be rented is a cooperative apartment in a building managed by a separate management company. Overtenant may notify the managing agent pursuant to the terms of the Over-Lease of the intent of Overtenant to sublease premises to Overtenant does not warrant or represent that the managing agent or coop will consent to this sublease. 26) The Fifth Avenue Manhattan Cooperative staff accepts packages only as a courtesy, which may be withheld. The Landlord, management and its employees accept no responsibility or duty of care to safeguard packages, or the value of packages left on premises, even if signed for by a building employee. The value of lost or stolen packages is the responsibility of the delivery company or resident. Do not leave or allow deliveries at the Fifth Avenue Manhattan Cooperative if this is unacceptable. Tenant and resident releases Landlord and all its employees from any responsibilities or any duty of care incurred now or in the future for safeguarding any item(s) of mail or packages received at the Fifth Avenue Manhattan Cooperative on behalf of tenant. It is expressly understood that this is a release. 27) Tenant shall conserve water and natural gas. 28) Children are not allowed to play in any public areas, and should be attended by an adult guardian at all times. 29) Residents and guests must wear proper attire, including shirts and shoes, in all public areas. 30) Laundry and compactor areas should be kept clean at all times. Compactor rules are clearly posted in each area and must be followed. Tenants must obey any environmental or recycling rules as they are promulgated. Tenants may not discard furniture of any sort or any item outside of normal household garbage into Landlord’s refuse. Tenant shall be billed as additional rent for the removal of any such items. 31) Resident agrees, at his sole cost and expense, to comply with all present and future laws, orders, and regulations of all state, federal, municipal, and local governments regarding the collection, sorting, separation, and recycling of waste products, garbage, refuse and trash. Resident shall sort and separate such items into categories as provided by law, and in accordance with the rules and regulations adopted by Landlord for the sorting and separating of such designated recyclable materials. 32) Landlord reserves the right to refuse to collect or accept from Resident any waste products, garbage, refuse, or trash which is not separated, and sorted as required by law, and to require Resident to arrange for such collection, at Resident’s sole cost and expense, using a contractor satisfactory to Landlord. 33) Resident shall pay all costs, expenses, fines, penalties, or damages imposed on Landlord or Resident by reason of Resident’s failure to comply with these recycling provisions, and shall indemnify, defend, and hold Landlord harmless from and against any actions, claims, and suits arising from such noncompliance, using counsel reasonably satisfactory to Landlord. Resident shall be liable to Landlord for any costs or expenses, including attorney’s fees, of any action or proceeding by Landlord against Resident, based upon Resident’s breach of these recycling provisions. 34) Tenants are not allowed to perform any maintenance, repair, renovation, or decorating that would involve in any way altering, moving or removing, or changing any item or surface in their Tenant shall become familiar with operation of all facilities and appliances in the apartment. Tenant shall not interfere with their designed function. Any use beyond the designed function or abuse of the above items shall violate the Lease, and Tenant shall be responsible for all damages that may occur. 35) Water closets and other water apparatus in the building shall not be used for any purposes other than those for which they were constructed. No sweepings, rubbish, rags, hair, oil, refuse of any type or any other article shall be thrown into the water closets or drains. Tenants who violate this provision shall be responsible for the cost of repairing the water closet, or other apparatus, and all ensuing damage. 36) Tenant must allow Landlord to exterminate for pests and vermin every month. Tenants requesting an exception show written proof that special conditions exist. Tenant must prove in writing every month that a licensed, professional exterminator has performed these services under the Landlord’s supervision and to the Landlord’s sole satisfaction. 37) Moving Procedures: Tenant must notify Landlord sixty (60) days prior to the termination of the Lease that tenant will not renew and intends to move out. Ten (10) days prior to the termination of the Lease, Tenant must notify Landlord in writing of the exact date and time of move out. Landlord shall have sole right to schedule moving. Tenant accepts and acknowledges sole responsibility for any damage caused by the move and agrees to reimburse Landlord out of Tenant’s security deposit, or owed to Landlord as additional rent if security deposit is insufficient to cover the charges. Tenant accepts and acknowledges sole responsibility for the safety and condition of any movers, professional or otherwise at any time they are on the Landlord’s property, and shall maintain at all times necessary proper insurance, including but not limited to workmen’s compensation, to indemnify and hold Landlord harmless from and against any actions, claims, and suits that may arise. Tenant agrees in advance to move out only between the hours of 9AM and 5PM Monday to Friday, and never on any holiday. Tenant agrees that Landlord’s use of any and all building systems, access ways or areas shall take precedence over any moving schedule. 38) Holdover tenants without a signed written Lease or Renewal will incur an automatic fifteen percent (15%) increase in their monthly rental rate that will continue each month until tenant signs a lease or renewal acceptable to the Landlord. Landlord may terminate a monthly tenancy with 10 days written notice. Landlord shall mail or send such renewal for tenant’s signature thirty days in advance. 39) Tenant agrees to allow only those persons appearing in the original apartment application, and no other, to occupy the apartment. Tenants who wish to allow any other person greater than overnight guest status must seek Landlord’s written consent in advance. Tenant must notify Landlord of the exact length of stay of any guest. Guests may not receive mail or packages at the building. Tenant acknowledges and agrees that only Landlord shall determine the number of people living in tenant’s apartment. Tenants allowing persons to remain in apartment will be subject to additional rent charge of $250.00 per person per month for any portion of a month the Landlord deems a violation has occurred. Tenants notified of a violation of this provision will remove any offending persons immediately from their apartment and pay any additional charges immediately. Tenant in a one-bedroom apartment will not allow occupancy of more than two adults and one minor child, tenant inclusive. Tenant in a two-bedroom apartment will not allow occupancy of more than two adults and two minor children, tenant inclusive. Tenant agrees in advance to pay Landlord’s reasonable attorney’s fees to enforce this provision. 40) Washing machines or dryers of any type are not allowed in apartment. 41) The security deposit may not be used as rent at any time. 42) Landlord has installed an operational smoke detector in tenant’s apartment at this time. Tenant agrees to maintain smoke detector for the duration of tenancy, including but not limited to replacing batteries when needed at tenant’s cost and expense. Tenant agrees to inform Landlord immediately if smoke detector becomes inoperable. Tenant agrees not to interfere with operation of smoke detector for any reason, except to change batteries. 43) Tenant acknowledges that the air conditioning and heating units servicing the premises contain fan units and valves located within the units. Tenant agrees to be responsible for the electricity consumed by such electrical devices as measured by your electricity meter and in no event shall the Landlord be responsible for the same. Tenant shall immediately discontinue use of any said device that malfunctions or leaks, and shall immediately notify Landlord of the same. A malfunction in any part of the heating, air-conditioning, or ventilation system in the Leased Premises. Tenant shall be liable to Owner for damages sustained to the Leased Premises or to Tenant’s person or property as a result of Tenant’s failure to notify Landlord of any of the above items. 45) Apartment must be left at the end of the tenancy in a broom clean condition, with no damages except for normal wear and tear. Bathrooms, kitchens and all appliances must be thoroughly cleaned inside and out, with no dirt, grease, or filth of any kind left evident. If Tenant does not leave apartment in satisfactory condition any cost incurred by Landlord to repair, replace or clean or re lease the unit will be deducted from tenant’s security deposit or owed to Landlord if tenant’s security deposit is insufficient to cover the charges. 46) Replacement Charges: If any items supplied by Landlord are missing or damaged and must be replaced Tenant will be charged for the current cost of the item, plus labor and service charges. 47) Tenant may not give keys to apartment or building to any person not on the original apartment Tenant must maintain access to keys at all times. Tenants who lock themselves out of their apartment shall pay a fee in cash of $25.00 to the Superintendent or building personnel prior to reentry. 48) Tenant waives any legal defense to eviction if they fail to keep their apartment neat and clean, and it results in a violation issued by a governmental agency. 49) Tenant shall keep the windows of the apartment clean. 50) The public halls and stairways of the building shall not be obstructed or used for any purpose other than ingress to and egress from the apartments in the building, and the fire towers shall not be obstructed in any way. No public hall of the building shall be decorated or furnished by any Tenant in any manner. 51) No animals shall be fed from the windowsills, terraces, balconies, or in the yard, court spaces, or other public portions of the building, or on the sidewalk or street adjacent to the building. The above response is for informational purposes only and is intended to protect Renters who are in or may enter military service. Housing built before 1978 may contain lead-based paint. Lead from paint, paint chips, and dust can pose health hazards if not taken care of properly. Lead exposure is especially harmful to young children and pregnant women. Before renting pre-1978 housing, landlords must disclose the presence of known lead-based paint and lead-based paint hazards in the dwelling. Tenants must also receive a federally approved pamphlet on lead poisoning prevention. Lessor has provided the lessee with all available records and reports pertaining to lead-based paint and/or lead-based paint hazards in the housing (list documents below). Lessor has no reports or records pertaining to lead-based paint and/or lead-based paint hazards in the housing. Lessee has received copies of all information listed above. Lessee has received the pamphlet Protect Your Family from Lead in Your Home. Agent has informed the lessee of the Lessor’s obligations under 42 U.S.C. 4582(d) and is aware of his/her responsibility to ensure compliance. Tenant(s) signing hereunder agrees to all of the above provisions without exception, and certifies they have received a copy of the Lease, Rider and Lead Paint Information Book and Disclosure Form.